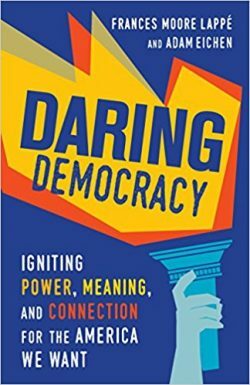 Francis Moore Lappé and Adam Eichen of the Small Planet Institute talk about their new book, Daring Democracy: Igniting Power, Meaning, and Connection for the America We Want. Then Adam Eichen is joined by Rabbi Michael Pollack to talk about a democracy initiative going on right now in Pennsylvania, the March on Harrisburg. It’s hard to be optimistic about our democracy as our President muses about becoming President for Life, our election system is under attack from those who seek to suppress the vote or hack it and oligarchic forces seem to have captured large portions of our government. It’s tempting to give way to despair. But Francis Moore Lappé and Adam Eichen say it’s not the huge challenge to our democracy that causes despair as much as it is feeling powerless — the feeling that standing up for democracy is futile. Their book Daring Democracy is a welcome antidote to despair. On the one hand, It demystifies how we got here by exposing the well-orchestrated effort that has robbed Americans of our rightful power. But it also explores solutions that Americans are fighting for right now. Even in this divisive time, Americans are uniting across causes and ideologies to create a “canopy of hope” the authors call the Democracy Movement. Francis MooreLappé founded the Small Planet Institute after the global success of her books about vegetarianism, starting with the hugely influential Diet for A Small Planet. In recent years, the Institute has broadened out from its work on sustainable food and agriculture to promoting democracy. Organizer Adam Eichen has joined her in that effort. After our interview with Adam Eichen and Francis Moore Lappé, Eichen mentioned he was about to go to Pennsylvania to help promote a pro-democracy, anti-corruption initiative called the March on Harrisburg. So a few weeks later, Writer’s Voice followed up with a Skype chat to Eichen and one of the leaders of the March on Harrisburg, Rabbi Michael Pollack.